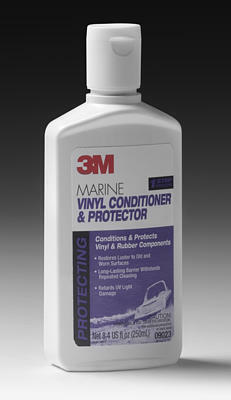 09023 3M� Marine Vinyl Cleaner, Conditioner and Protector, 9023, 8 oz. Home > MAINTENANCE > Cleaners & Polishes > 09023 3M� Marine Vinyl Cleaner, Conditioner and Protector, 9023, 8 oz. Unique gel formula provides durable protection in exterior, as well as interior applications. Gel formula gives you better application control than liquids. A little bit goes a long way.